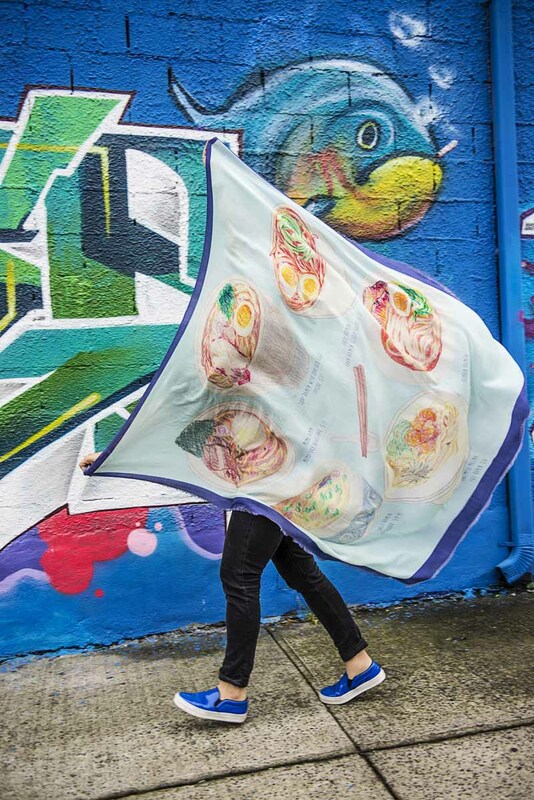 Described as awesome, cheeky scarves with the finest, plush materials, CJW Scarves is the brainchild of artist-turned-designer Christina J. Wang. This new line of scarves feature hand drawn objects such as ramen bowls and Fendi fur charms digitally printed on featherweight wool. Inspired by art, popular culture, bright colors, classic glamour, international travels and everyday comforts; the collection functions as a whimsical, spontaneous and plush time capsule. The products are designed to envelope you in warmth and act as the perfect companion to any outfits or adventures for many years to come.